It has been over three years since I provided an update on the investments that I hold. Anyone who has attended a Financial Learning Experience has heard me say that it is important to INVEST money and to do so every single time you are paid money. 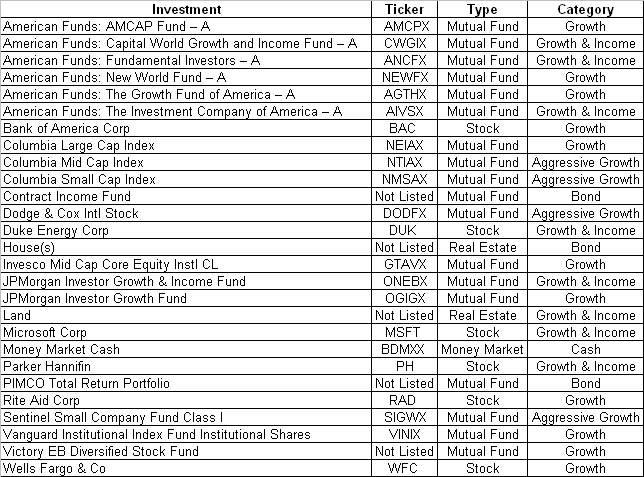 So today, for those inquring minds who want to know … I am publishing some of the mutual funds/investments that I own. Click the image to see a larger version. 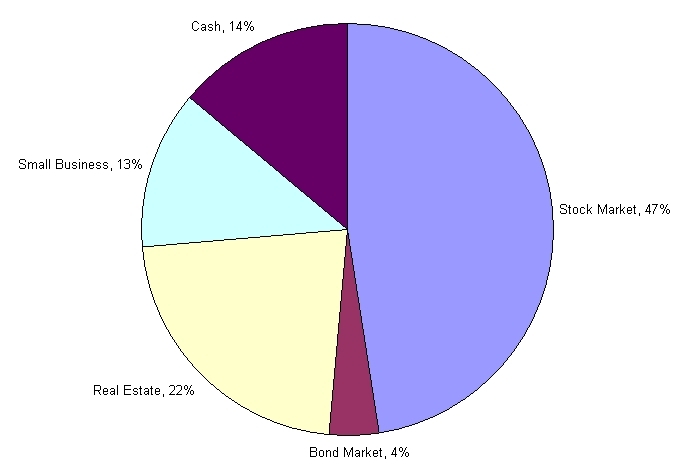 I have went even further in my analysis this time to indicate my portfolio diversification. Over the past several months, I have been writing and speaking to the fact that I am diversifying my investment portfolio to include land and real estate. The portfolio below indicates some of those decisions. As you may have noticed during the latest recession, a rising tide will lift all ships and a lowering tide lowers all ships. If you have market funds, you saw this happen. There were many great companies that retained profitability throughout the market downturn, but their stock value was pummeled due to the overall market conditions. While I have been greatly diversified in my investment choices, I was diversified WITHIN the stock market. This is one of the reasons that I have made a focused effort to diversify my holdings beyond the open market. I believe it is important to maintain margin. Cash on hand is essential to the long-term success of any effort – personal, small business, or large business. Investment Junkies: What are your thoughts on my portfolio? What are some key funds that you really like that have worked well for you? Looking for additional Personal Finance Resources? You can obtain FREE FINANCIAL TOOLS by clicking HERE and purchase books/materials by clicking HERE. This month the US National Debt has increased by $98,640,261,756 since our last update on February 18, 2011. This is actually around a 36% smaller increase compared to the increase between January to February. If you divide the national debt by the 308.8 million people in the US, each individual’s portion of the debt is over $46,100. If you were told today that you would have to repay your portion of this debt, could you? Or are you living paycheck to paycheck, and a debt like this would cripple you financially?